a book chick: "The Storied Life of A.J. 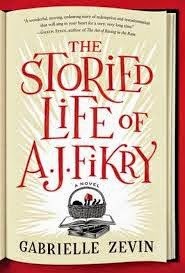 Firky"
"The Storied Life of A.J. Firky"
my take: This is just fun. If you love book stores, if you love books, if you love love triumphing over loss, you'll love this. Each chapter is based on a different literary work and starts with a mini book review ... the kind you might write on a 3x5 card (or something a bit fancier if the bookstore is inclined) and hang on the shelf under the book for customers to peruse ... written by the A.J. Firky, the fictional bookstore owner. Which is one reason I loved it. The setting is mostly in the bookstore, so what's not to love? I bought it in hardcover, so please borrow. Looking forward to it now! This was a delightful, quick weekend read. Ah, book stores!